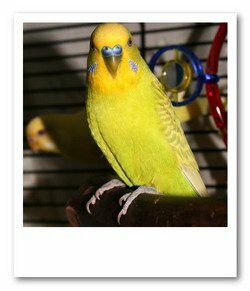 Once you recognize parakeet illness symptoms you will need to do something about it. The best thing you can do to help a sick pet is to take it to the vet. Until you do, learn some first aid for sick parakeet. Note that when visiting a Vet, it is helpful to bring the bird in his actual cage. Birds will attempt to hide illness when in a strange environment as a protective measure. Bringing the parakeet cage will make the bird comfortable and provide the Vet an opportunity to check things such as hygiene and even diet. For example, all because you are feeding your Parakeet a high quality food does not mean that he is eating it. A veterinarian will observe the bird's activity level, posture, attitude and appearance as compared to other avian patients. If you see your pet is all fluffy separate him from the other birds (if there are any). If you can, measure your parakeet's temperature. 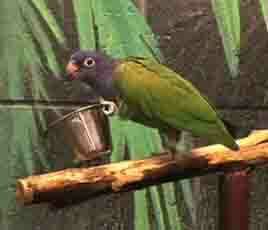 When sick, parakeet's temperature will be lower than when healthy. Healthy bird has a temperature of 40,5 to 42,6 degrees Celsius (105 to 108.5 degrees Fahrenheit). The lower the temperature goes - more severe the illness is. Other signs of illness include abnormal feather coloring, too many pin feathers (developing feather) and over grown nails. It would be good to put the bird in warmer environment, where the air temperature would be about 38 degrees Celsius (100 deg. F). Put some clean paper towels on the cage bottom and change them several times a day. It is very important to maintain hygiene on the highest level when it comes to illness prevention and treatment. as that found in Kaytee Forti. A parakeet on a seed based diet alone may not be receiving all of the nutrients needed, particularly when young. There are two periods in a year when parakeets are more sensitive. It happens when they are changing feathers. Normally that would be March and September (European climate). This period lasts about 4 to 7 weeks. Changing feathers exhausts the bird and it is much easier for him to catch some parakeet illness. While changing feathers the bird can get really nervous. He will sometimes nap a lot while changing feathers and he will be all fluffy with a lot of feathers falling off. As we know, these are parakeet illness symptoms but in this case there is probably nothing wrong with the bird. At times the bird will pluck old feathers. Sometimes that can cause injuries and bleeding. You can stop the bleeding by applying light pressure to the spot with a piece of cotton. Birds kept indoors, like the pets I am talking about, have more trouble in this period than the birds in breeding houses. When the temperature suddenly raises (like in the fall when the heating in apartments starts), they can suddenly loose a lot of feathers. They will look pretty bold. One more situation that will make this more difficult on the bird will be if the apartment air has less than 40% humidity. Anyway, you should pay special attention to your bird in this period. If it is possible you should keep the area where the bird is located warm, as the bird will be ?naked? and more sensitive to cold. In this period you should feed budgie parakeets better. So, besides seeds, fruit and vegetables, you should give them hard boiled egg whites and some vitamins. Once more, we are reminding you that all these advices are just first aid for the illness. If you see your pet is sick, try to get him to the vet as soon as you can. And let us not underestimate the power of preventing illnesses. Feed your pet the best food, keep him clean, make sure he gets enough fresh air, give him toys so he can enjoy himself and be his friend. That will do more for his health than any medicine in the world. Have a Parakeet Health or Care Question for our Vet? We Will Answer it for Free! Do you need Parakeet health or care advice? Just ask a question and our Vet will answer it as soon as possible for FREE. 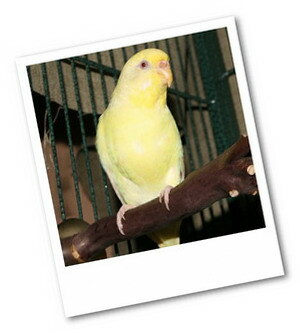 Please upload a picture of your Parakeet, especially if you believe it will help the Veterinarian. This is often the case when you are concerned with a Parakeet skin disease or feather problem. Please know that we receive many questions and answer them on a first come, first served basis. If you need an immediate response, we suggest you use this online veterinary service that is available now to answer your questions. Entering your question is easy to do. Just type the question here!...Do not use all capital letters.